This production of Die Frau ohne Schatten was a big success for Frankfurt Opera. It was first seen in 2003, and that year won Sebastian Weigle the title of “Conductor of the Year” from Opernwelt magazine. Now it has made it to CD, from live performances in 2014. And the results are impressive, vindicating both Oehms’ long-running collaboration with the company, and the production’s decade in repertoire. These Frankfurt recordings are made in-house by an audio team engaged by the company. They use an elaborate system of microphones integrated into costumes to capture the singers close-up. That provides impressive clarity, but it’s not the whole story, as the action here takes place in a wide and involving soundstage, with all the singers given a well-defined position in the stereo array. It gives a very convincing impression of live performance, and the recording is all the more engaging for it. From the stills in the liner, the production looks to be an economical but intelligent affair. The settings are minimalist and monochrome, with a concrete wall for a backdrop. Dress is modern-day, or perhaps early 20th-century, and the various animals and supernatural visitors are all designated with simple white masks. As might be expected from an upper-ranking provincial house, the singers are all good, but few are of global stature. This 2014 staging is significant as the final stage appearance of Terje Stensvold, in the role of Barak. He’s over 70 here, and the age certainly shows, not least in his lack of tonal focus and projection. Still plenty of star quality though, and plenty of drama from him. As his wife, Sabine Hogrefe, is secure and imposing. She has all the high notes, and projects well, but isn’t quite as nimble or as vocally athletic as the part demands. Burkhard Fritz is a convincing Emperor, despite not having a particularly large tone, and occasional lapses of rhythmic security. More imposing is Tamara Wilson as the Empress, her very pronounced and wide vibrato taxing on the ear, even if it does provide valuable support to her tone. As the Nurse, Tanja Ariane Baumgartner gives the athletic performance that the other female leads seem to lack. She has some tuning problems in the highest register, but has a very warm and satisfying tone lower down. And her diction is excellent throughout. The remainder of the large cast is presumably made up of singers from the company, who make for an ideal ensemble and give strong accounts of all the smaller roles. 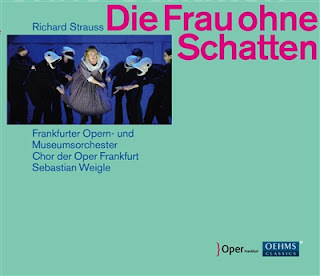 No complaints about the orchestra either, the various string and woodwind solos are all well taken, and Strauss’ often radical scoring always seems logical – and lyrical – from these forces. Both the singers and the players demonstrate the value of deep familiarity with this complex score – that decade in rep has done wonders, and the recording feels like it has captured the production at its musical peak. I’m a big fan of Sebastian Weigle, but I know that some find his work pedestrian. This might just be the recording to change their minds. Weigle always strives for clarity of line and texture. He’ll often slow the tempos to achieve this, or forgo overt rubato. His reading of this score is more supple than in his Wagner recordings – the Ring from Frankfurt, Meistersinger from Bayreuth – but he still retains that sense of precision. Balance between stage and pit is excellent - no doubt both the conductor and the engineers should take some credit for that. If I’ve one niggling concern, it is Weigle’s willingness of give the lower brass their heads at almost all the climaxes. That was a problem in the Ring cycle too – the end of Rheingold sounded like a bass trombone solo – and becomes more acute here, as Strauss’ scoring is so bass heavy. Nevertheless, the low brass (which includes Wagner tubas) never dominates, and the balance within the orchestra is carefully maintained. Any concerns about Weigle’s lack of drama can also be allayed by the imposing climaxes, and even by the surging orchestral outbursts that punctuate the drama. The conclusion of the second act is an astonishing demonstration of orchestral power and interpretive determination; even listening at home it’s a traumatic experience. All round, an impressive reading, then. It’s a must for Sebastian Weigle fans like me, and it might just win him a few more along the way. His contribution here is exceptional, but he is supported by a good cast and a committed orchestra, and it is all recorded in fine audio. Libretti with opera recordings are the exception rather than the rule these days (especially for works still in copyright), so we are lucky to have one here, even if there is no English translation. All of which goes to make this a thoroughly serviceable and hugely enjoyable version of this complex and beguiling opera.